Am not a big fan of chicken liver recipes. But this is my hubby's all-time favorites. As some of my readers suggested me to include more recipes with Chicken liver, i started liking the same. 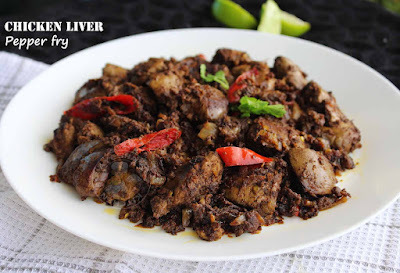 So here am with a spicy and delicious roasted chicken livers where all the spiciness is from freshly ground pepper. Moreover this recipe calls for simple ingredients only. Like my hubby, some people crave for fried chicken livers. This chicken liver pepper fry is delightful and pairs best with steamed rice. Those chicken liver lovers will surely finish this off in one sitting. 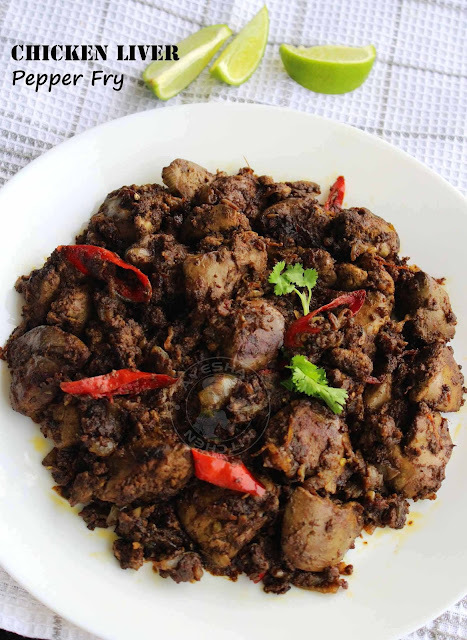 Hope you all liked this nadan kerala style chicken liver pepper fry (nadan karal olarthiyath). Heat oil (preferably coconut oil) in a non stick wok. When hot, add chopped ginger and chopped red chilies to it. Saute for a while and then add fennel seed powder(perum jeerakam powder). Mix well. Now add sliced onion and saute till onion turns golden and soft. Next, add the sliced tomato and cook until mushy. To this, add the chicken liver (well drained) along with turmeric powder, coriander powder, chilli powder, pepper powder, and salt. Combine very well and close the lid. Cook on a medium flame for about 7 -10 minutes. Do not add water. Stir occasionally. When done switch off the flame. Now for seasoning, heat oil in a frying pan and fry chopped small onions(shallots). When done, add the cooked chicken liver along with the thick gravy. Cook until the liver gets fried well. Saute well occasionally. Finally, when done, add half a tsp of pepper powder and toss very well for 2 minutes over a high flame. Now you can see the gravy becomes completely dry and chicken liver will be well coated with this pepper gravy. Remove from flame. Garnish with some chopped coriander leaves. Serve hot along with rice, bread etc. 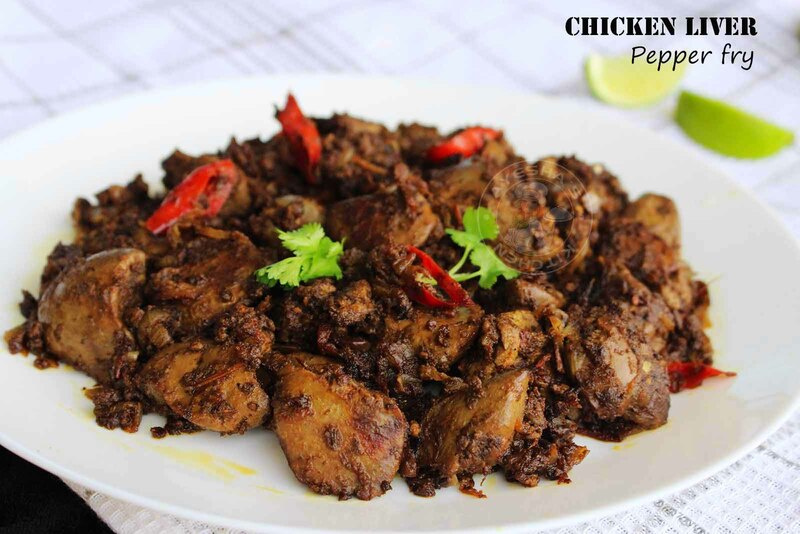 Please watch the perfect recipe for Lamb brain pepper fry video here - click here.